New to the gear drawer this week is the Petzl Tactikka, which has recently been updated for 2017. Petzl is a brand synonymous with both climbing gear and headlamps, and has a long history of making high-quality equipment for the outdoors. Of these, this tabletop review focuses on the basic Tactikka model (smallest of the lineup), which is now putting out an impressive 200 lumens of white light, and features a secondary red LED. No filters needed for red output. White output mode now steps from low -> medium -> high. Whistle built into headband strap. Now accepts lithium AAA batteries. Compatible with new Petzl “CORE” rechargeable battery unit. Compared to the standard Tikka, the Tactikka is offered in more subdued color options (black & camo), omits the reflective accents on the head strap, and loses the glow-in-the-dark section around the LED emitter. Other than that, the units are identical in size, weight, and features. The white beam has a built-in diffuser, and the resulting profile is a good mix between throw and flood. The tint seems to be good, for example — allowing you to read features on a map and easily discern the various colors. Red: Steady On (5 lumens) / Strobe. One feature not very clearly advertised in the manual is that you can also reach the red output mode directly from off — simply press down and hold the power button for a couple of seconds. The red secondary beam has quite a bit of throw, allowing you to see a good ten feet (3 m) in front of you. It’s also handy for reading a book without overwhelming you, allowing you to see all of the pages at arm’s length or closer. The Tactikka can be powered by three “AAA” sized batteries, and will run on alkaline, rechargeable NiMH, and lithium cells. If you plan on using NiMH batteries, a good suggestion would be picking up some of the Eneloop variety. Especially since the basic Tactikka is not a regulated (constant output) headlamp. Also new this year, Petzl is introducing their revamped “CORE” battery system. This is an entire rechargeable battery unit that can be placed in various compatible headlamps, instead of using AAA cells. It features a 1250 mAH lithium-ion battery and is recharged by way of a USB connection. 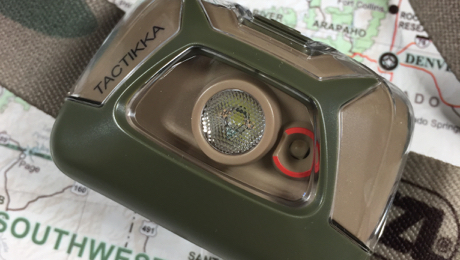 If you’re looking for a quality headlamp that won’t break the bank ($29 at this writing), absolutely check out the new Tactikka and Tikka. If you want to save a few bucks, even the new Tikkina ($19) is a great purchase (lower output, no red secondary). Everyone should have a good headlamp at their disposal. If you already are a Tactikka user from a few years ago (the flip-up filter variety), this updated version is a nice addition to the gear pile. The only downside is you lose the ability for the main white beam to flash/strobe, which can be handy when trying to remain visible or signal in a survival situation.